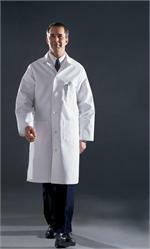 Those medical professionals and other technicians that require a lab coat for work will certainly appreciate one that is high quality, yet affordably priced. This full length lab coat from Scrubs Unlimited might be just what you’ve been seeking! This men’s lab coat features a full length design with standard pocketing to help you keep the things you need handy, as well as an adjustable back belt for the best possible fit. Plus, because it is made by Medline (Angelica), you can rest assured it is of top quality construction. Count on Scrubs Unlimited to be your best source for lab coat options as well as top name scrubs. Whether you’re looking for a full length lab coat or some basic, durable, and affordable scrub bottoms, we have the prices and selection you want!